Christian life entails suffering, sometimes great suffering, and the response distinguishes a Christian from others: in the midst of hardship and even persecution he forgives and gives praise to God. 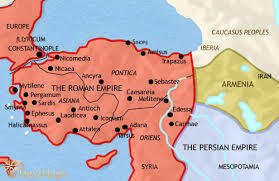 Our saint was banished a second time from Constantinople, on this occasion to Caucasus, on the eastern slope of the Taurus, a mountain range in the south of modern day Turkey. He was led there by two soldiers who treated him well, but at the time of year in which he traveled the heat and dryness of the land made it a very difficult journey, one which would have been relatively easy on a government conveyance. Instead he traveled on a mule drawn cart. They passed the majestic Nicaea and traveled through the corn country of Phrygia to the city of Ancyra. On reaching this city they found devastation from Isaurian invaders and traveled day and night for 200 miles to Caesarea, the capital of Cappadocia. To another friend by the name of Theodora he complained that his wealthy friends did not do anything to make his exile closer to home and a better one, and of their silence. He wrote to her: “I am astonished at you,” he says; “this is the fourth, if not the fifth, letter I have sent you; and you have sent me but one. It pains me much to think that you have so soon forgotten me.” But as Newman explained some of these friends such as Tigrius had suffered torture and martyrdom in the meantime. He felt the need to tell his friend and, through her other friends, that he had regained his health, and that he was not suffering from the cold winter climate or from the threat of the Isaurians who had returned to their country. His only fear was from the bishops, except for a few, who wished to harm him. Again Chrysostom complained of not receiving letters from his friends, even while they could complain likewise, not having received his letters. For instance, he wrote to Olympias: “How is it that you say, you have received no letters from me? I have sent you three; one by the soldiers of the prefecture, one by Antony, one by your domestic Anatolius: they were long ones.” Persons, including holy men and women, can suffer at great lengths except for feeling forgotten by friends or not hearing from them. Chrysostom reminds us thus of the value placed on friendship, and how true friends sustain one another in suffering, whether in person or in writing. There is yet another equally important lesson – that at times Christians will suffer persecution at the hands of fellow Christians, even bishop and monks. And that saints try to see in this the hand of God some higher purpose, and, like St. John Chrysostom following in the footsteps of St. Paul, try to rejoice in their suffering and to give glory to God by the manner in which they embrace the Cross and forgive others. This ancient city is modern day Göksun in the Mediterranean region of Turkey. Later on he was sent further away to the Caucasus, on the eastern coast of the Black Sea. This is a continuation of various posts on St. John Chrysostom by John Henry Newman from Historical Sketches, first published in the Rambler (1859-1860). These were descendants from Cilician pirates, once suppressed by Pompey who in the reign of Constantius began to devastate the land.